My 15GB download limit using wireless, the only service that can provide broadband speeds in the area I live, was consumed days ago. It is now the day before the download limit is reset, which happens to coincide with the day I have the most time to focus on my research. I need to answer a specific question about the NBN. I am aware of the plan to see Telstra’s copper networks decommissioned and also for Optus’ HFC network to be decommissioned, and that NBN Co will provide a national Layer 2 wholesale network. I am also aware that it will be possible for NBN Co and its wholesale customers to provide point-to-point services for enterprise networks and to operate as wholesalers using NBN Co's infrastructure. However, my question is, once NBN has control of the wholesale infrastructure, will the market for wholesale infrastructure be contestable? For example, what will prevent another provider, or indeed, an existing provider such as Transact in the ACT, from being a wholesale provider over a new or an existing network? Is there a specific law that gives NBN exclusive wholesale Layer 2 provision in Australia? 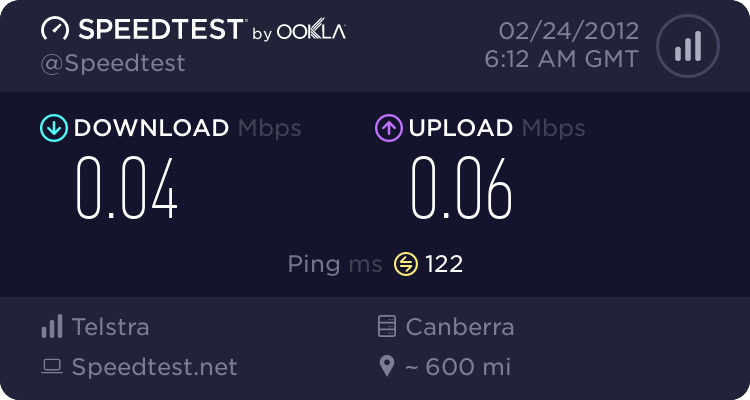 To answer this question, I have been using my shaped wireless connection to download copies of NBN Co's annual reports and some other information from the DBCDE website. The tabs for the NBN Co sites have been sitting there spinning for hours. Just a few more hours to go before my plan is reset. Just a few more years before we get affordable high-speed broadband in Palmerston. The irony is that right now, I am literally waiting for the NBN in Palmerston via Gungahlin.